As the world turns Jamaicans, are glued to the live broadcast of what i call the KD Knight Show, aka the Manatt Commission of Inquiry. 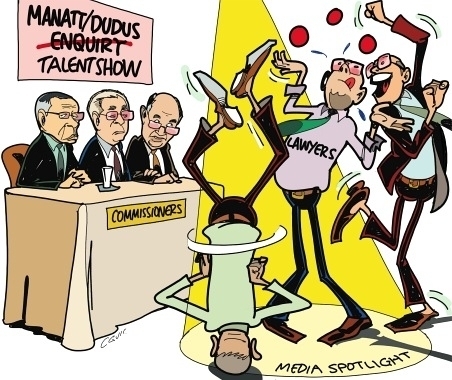 A semi-judicial reality show of no mean order Jamaica’s legal heavyweights have finally attained their share of the videolight and boy are they revelling in it. The Inquiry is investigating the circumstances leading to the extradition of former Don Christopher ‘Dudus’ Coke in June last year. Meanwhile most witnesses called to the stand are tight-lipped and suffering from memory lapses (most notably the Minister of Security, Dwight Nelson). Pity you can’t just plug in extra memory modules to boost their recall. If nothing else the Inquiry has generated some hilarious political satire such as this Facebook conversation below. All names have been changed to protect the identity of the participants. Hear Ye, Hear Ye…we have some Limited Edition Manatt Enquiry stuff for sale….’silent auction’ cos we caan afford wi wake up d ‘Asst Page Turners’…Link me een mi inbox for samples…. (ef oono c Dennis Brooks a advertise nuttn no buy e…a teefn goods)…anyways….sen oono credit card come quick cos dem soon done. LGY We have tings like “I don’t recall” T shirts in Green! “I don’t remember”T-shirts.., IN GREEN! We also have green t-shirts with Dudus face pon di front and a big X through it,and round the back the words “I do not know him”! ALL Green shirts are special edition! 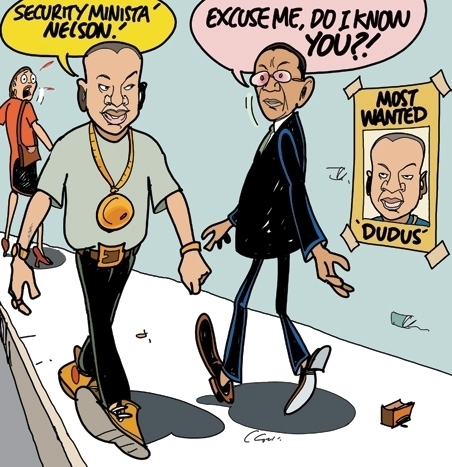 Jamaica Observer, February 20th, 2011 During witness testimony at the Manatt/Dudus enquiry, Minister of National Security, Dwight Nelson, claimed that he did not personally know alleged Tivoli Gardens strongman, Christopher ‘Dudus’ Coke. Clovis. LGW And we have some orange t-shirt whe sey “I saw the secret MOU”! SW Yes Yols,,,,in dat dere package we will also have little dolls of the ‘Asst Page Turners’…u can put batteries in dem and dey will speak…albeit slowly but speak they shall…dey will even turn d pages for you & d controls will allow you to adjust d volume so dem can ‘whisper’…now dat oono affi order fast cos dem EXTREMELY LIMITED!!!! LGY yes Clyde we have those too! How much you want? LGY soon set up your ting! SW Yols…..ef Clydey buy a good amount we can give him two ‘free’ shirt fi good measure…Clyde…u no waan d two dolly dem man?? cho! LGY eeeh? Buy di dolly dem nuh? How yuh ah move tight suh? Ah mussi yuh name Harold Brady! LGY ah dolly we have, dem battery operated and do tings! Not much, but dem do tings! SW Clyde…anything u waan wi ave it…we will ‘custom bill’ e for u ongle….puppets we do ave….jus tell wi ow much u waan an mek sure u tek off d 2 dolly dem off wi Hands…u can go sell dem bak pon EBAY an mek NUFF NUFF money cos e price a go skyrocket by year end…wos wen election close! LGY Yes I know that U know that I know what u know … I’m not daft! 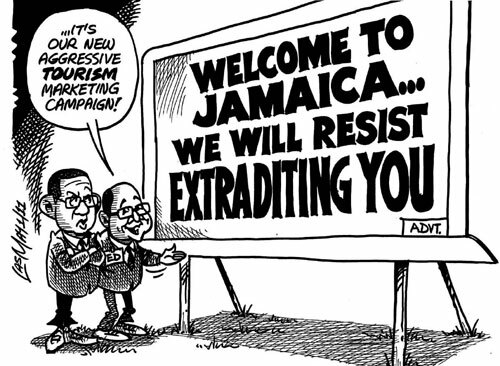 Mr K.D.Knight should comment on the secrett MOUs and a meeting held in New York on Sunday, February 8th, 2004.